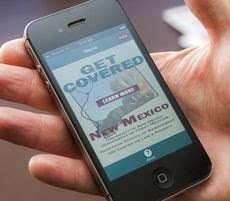 For many New Mexicans, the Affordable Care Act can be a bewildering maze of information. Anderson School of Management Professor Nick Flor has been instrumental in developing an application that provides New Mexicans with tools and data designed to help them better understand what their health insurance options might be, where they can apply for coverage, and what documentation they’ll need to enroll. Dr. Flor, teaming with University of New Mexico School of Medicine graduates Dr. Erin Corriveau, currently a preventive medicine fellow at the Johns Hopkins Bloomberg School of Public Health in Baltimore and Dr. Kate McAlmont, a resident in the UNM School of Medicine’s Department of Family and Community Medicine, intend the free app to provide users with solid, truthful information about the ACA.